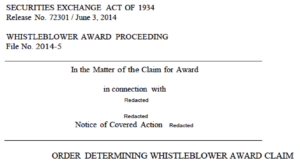 Two whistleblowers voluntarily provided original information and assistance to the Unites States Securities and Exchange Commission that, according to an SEC press release, “enabled us to investigate and bring a successful enforcement action in a complex area of the securities markets.” In its Preliminary Determination, the SEC’s Claims Review Staff (“CRS”) recommended that the Commission grant SEC whistleblower award payments to both whistleblowers. The CRS recommended that the total combined award be the maximum 30% allowed under the SEC whistleblower program. 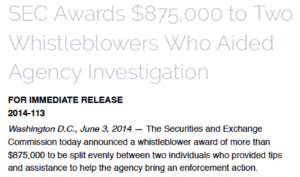 The two whistleblowers were to receive individual SEC whistleblower award payments of 15% each. Neither of the SEC whistleblowers challenged the CRS’s Preliminary Determination. The Commission entered an Order Determining Whistleblower Award Claim. In that Order, the Commission granted the SEC whistleblower award payments as recommended by the CRS in the Preliminary Determination. According to the Order, the SEC whistleblower statute says that SEC whistleblower award payments are made from monetary sanctions collected in the SEC’s Covered Action. A portion of the disgorgement and prejudgment interest ordered to be paid in the Covered Action was “deemed satisfied” by Respondents’ [the wrongdoers’] payment of that amount pursuant to a civil action brought by [Redacted in original] and shall be included in our calculations of the award payments to the claimants here. We interpret Section 21 F(b)(1) of the Exchange Act, which provides for payment of awards based on “what has been collected of the monetary sanctions” imposed in a Commission Covered Action, to include amounts that are deemed satisfied when collected in actions brought by other governmental authorities. In the SEC’s related press release, its Chief of the Office of the Whistleblower stated, “Whistleblowers who report their concerns to the SEC perform a great service to investors and help us combat fraud”.